Darkmoon Knightess is Anor Londo's Fire Keeper, bound to the bonfire to keep it lit. After becoming Undead, she visited the Dark Sun Gwyndolin, became a Blade of the Darkmoon, and assumed the flame-keeping duty. She received the Brass Set armor, which hides her hideous form and helps her hunt the guilty. She also acts as a guide for the city of Anor Londo, giving directions to the Chosen Undead. 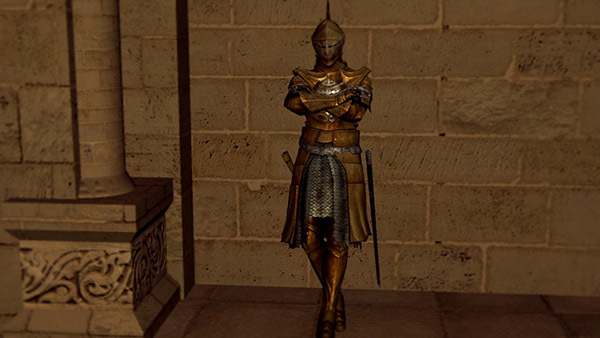 Next to Anor Londo's first bonfire, leaning against the wall. If you kill Gwynevere, Princess of Sunlight, she will be at the cathedral side of the spinning bridge, hostile. If given a Fire Keeper Soul, she can improve your Estus Flask power by one level. Use the "Reinforce Estus Flask" option on her dialogue menu. As she is the Fire Keeper of Anor Londo, the bonfire becomes unusable when she dies, although it can still be warped to. When you're a covenanter yourself, she'll have additional dialogues. Most of the time, if you made her hostile, she will be near her bonfire. The bonfire becomes unusable not because she was made hostile, but because there's an enemy nearby. So, if she does become hostile and she is waiting on the cathedral side of the twisting tower, her bonfire is still usable. However, merely leading her away from the bonfire does not seem to reactivate it in the normal fashion. Drawing her partway into one of the giant sentinel rooms near her chamber will make it easy to return to the fire without her (she isn't very fast) but the fire will still be unusable then. Taking her down the elevator might be enough (investigation is needed here), but it's not worth trying unless you're expecting to kill her anyway, because she doesn't understand elevator safety at all. You would need to babysit her on the way down (with kicking or Force, perhaps) to keep her alive. One may also be tempted to sneak up on the bonfire with stealth powers, or to quit and reload right next to it, in order to sneak in a rest before her hostility deactivates it. But none of this seems to work either; Oswald may be the only answer in this case. You can kill the Lady of the Darkling after you joined the Blade of the Darkmoon without getting kicked out of the Covenant. You do not lose a Rank either. She wields an Estoc and a Parrying Dagger. Similar to Lautrec, she can block with her left hand weapon. She'll attempt to parry your attacks. She can cast Darkmoon Blade miracle on her Estoc, and it has no casting limit. exit here and head straight yonder. If you are the chosen one, a revelation shall visit thee. What am I? Well… I am the Keeper of the bonfire. The bonfire attended by the Keepers are special. They are linked to one another, and their flames never die. Yet never shall the Keepers of these flames meet. If you require rest, now is the time. That is, after all, what the bonfire is for. Hmm. You have survived. Impressive. Hmm. So, you have received a revelation? Very auspicious. I hope for the best. I pray that through you, Her wish will be granted. Have you heard of Seath the Scaleless? In legend, he turned against the ancient dragons. He became Lord Gwyn's confidant, was granted dukedom, and was allowed to pursue his research. At the Regal Archives, he immersed himself in research on scales of immortality, the one thing that he did not have. The Archive became a dungeon, a place for sinister experiments. Now, nobody dare even approach the duke's forbidden Archives. It looms over this land, high atop the mountain. Oh… You are one of us. That is a surprise. But a pleasant one. We are both Blades of the Darkmoon, now. I shall look forward to fighting alongside you. Go ahead, you may rest here. Even an undead requires repose. So… it was you, was it? How dare you produce a blade upon a deity? How did you ever get this far? Very well. So be it. Expunging fools like you is part of my charge. What you saw under light of the Darkmoon shall haunt you forever.